U.S. Rep. Bill Huizenga, left, Grand Haven Mayor Geri McCaleb and Grand Haven Public Safety Director Jeff Hawke stand on the southbound U.S. 31 drawbridge on Aug. 22, 2018. 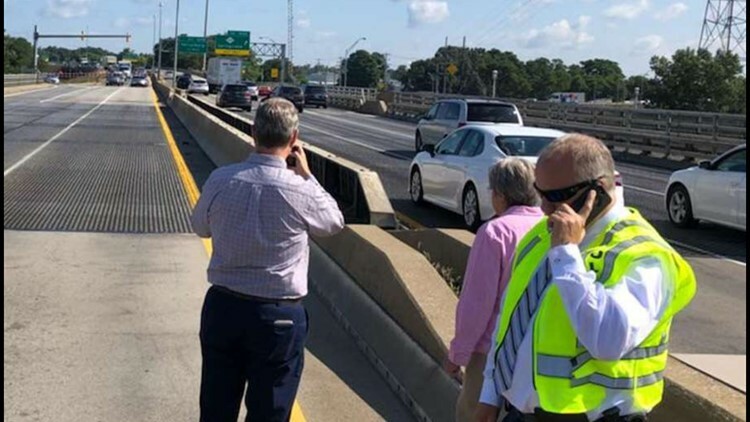 The officials were holding a meeting to discuss possible local controls on drawbridge openings when the bridge became stuck. A fixed bridge to replace the drawbridge has been proposed over the years, according to city officials. GRAND HAVEN, Mich. (Grand Haven Tribune) - Motorists can expect delays on northbound U.S. 31 starting Monday, Feb. 11, as major repairs are made to the drawbridge over the Grand River.